I blogged for the majority of May - that's 26 posts in 31 days, I hope you won't mind that I missed a few, but I have to tell you this is a massive achievement for me. I often set myself goals, think up good ideas but never see them through to fruition so to get to the end of the month and not feel like a total failure is a big deal! 26 photography / editing / sourcing sessions. 26 Twitter, Facebook, Pinterest promotion sessions. It's a lot of work! But it's also a lot of fun, and the rewards far outweigh the effort. I've often been a bit of a fair-weather blogger. My posts have been somewhat sporadic, I guess I'm an all or nothing kind of gal so I'll go through bursts of posting and then have six months where I'll post nothing. A lot is tied in with my mood and whatever else is going on in real life, which I think we can all understand. Life has seasons. But I really wanted to discipline myself with this challenge. To find a rhythm in blogging that fitted with my life. I wanted something that would make me fall in love with writing again, that would make it feel less of a chore, I wanted to work out what I was good at, and what I should leave to the experts, I wanted to experiment, see what I enjoyed writing about, find out what people enjoyed reading, and by blogging every day there were plenty of opportunities for learning! If you're going to take on a challenge like this, you need to give yourself permission to do so. You need to be doing this purely for your own enjoyment, it's a little piece of your own time every day that is solely yours and you need to give yourself permission to take that time out and prioritise it in your day. When I was self-employed I struggled to blog because I felt like maybe I should be working or at least blogging for work purposes. Now that I have 'permission' to purely blog for the enjoyment of it, I can do it much more freely without worrying about whether anyone's reading, responding or giving me money for it. I started off the challenge because I saw two fantastic bloggers running it, both provided prompts to help generate topics and on occasion I was inspired by these prompts. But for the most part, I wasn't - or at least I was inspired to write about other things. So I did. I did enjoy the prompts and will probably refer back to them if I'm ever struggling for ideas again, but if you've got a burning desire to write about Kate Middleton's baby, don't feel like you have to stick to a list of prompts that don't include that! The same goes for linkys - don't join in a linky just because you feel like you should, but if you blog something that fits in with a linky theme then link up to your heart's content! It's easy to get discouraged if you miss a day, or neglect to post when you really wanted to, and in the past I've tended to give up all together when I hit a wall. But sometimes it's just a case of cutting yourself some slack. If you look at the days I missed in this challenge, you'll see that the majority of these were towards the end of the week. I realised Thursdays are not good days for me. We're tired, we're looking forward to the weekend, we do things on Wednesday and Thursday evenings which would mean to post on a Thursday or Friday I would have to blog during the day - not gonna happen! But as long as you spot these patterns you can just plan for them: schedule your posts weeks in advance for those days, decide not to post at all on those days, or decide to do simpler posts that don't require lots of photography or image editing. On the whole I blogged every day and scheduled the posts for 7am the following day. This worked best for me, I'm not the type of person who can sit down and write five blog posts in one go (though the intention is there). However, I do need to schedule posts for the following day otherwise I would post at 9pm one day and 11am the next - giving no breathing space for the posts to be promoted or gain any sort of momentum. Scheduling promotional Twitter and Facebook posts are also a must otherwise no one would ever know the posts were there (though I'm yet to find a way of doing this that suits me - any advice much appreciated!). There's a funny paradox in this. You would think that if you write more you might start to run out of ideas. But the more you write, the more inspiration you find, and the more you want to write. Sometimes I've wondered how bloggers keep going for years without running out of things to say, but I can totally understand now. I've got a zillion ideas buzzing around in my head! I won't continue blogging every day - I couldn't handle the pressure - but I will be blogging multiple times per week and I'm now busy putting together some kind of schedule to make that happen. As I set out with this challenge I really wanted to work out where my niche was in the blogging world. I don't consider myself a mummy blogger, although I am a mum who blogs about her family life. I don't craft anywhere near enough to be a craft blogger and my photography skills are not up to scratch to do any kind of design or image-led interiors blogging. However, I do have opinions. Lots of them. I love consuming the news (that's the journalist in me) and deep down I've always wanted to be some kind of columnist. It was these opinion based posts that got the most views, the most comments and responses and that connected with my readership. I also found myself really enjoying writing about writing - literature, authors, the writers life - and posting Sunday Thoughts every week to encourage people in their faith. So I may well continue in this vein and see what happens! Tomorrow I'll be posting a round up of my #BEDM Best Bits, but in the mean time, check out the lovely blogs from Rosalilium and Found Love Now What, who were the bloggers who set me the challenge in the first place. I may not have followed your prompts or joined in the chat as often as I should, but I am eternally grateful for the inspiration - I did it! 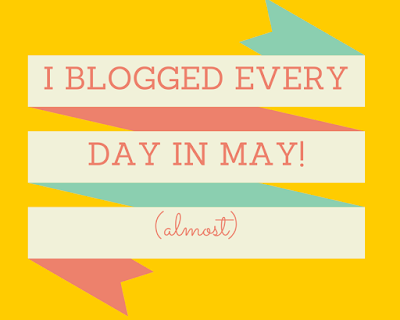 I'm took part in Blog Every Day in May! Thank you for this. I am still new to blogging and tend to blog once a week although I'd like to blog more. This was a great read. Thank you and good luck! I think the secret is to keep doing what inspires you. If you love what you're doing, other people will love it too. That's really interesting. I have had to write about 4 blog posts this week, and I was dreading it, but like you, the more I wrote the easier it flowed! It's funny how it works but as long as you love the subject I think it could just keep going, and there's always new things happening to keep you inspired. Love this post and agreed with so much of it! Can't imagine getting it together enough to blog every day though. Well done! Oh believe me, neither could I! It was a bit of a pipe dream, but to get to the end and to have done 26 posts was such an achievement. I won't continue with that many but I can see myself doing four days a week and still enjoying it and making the time to do it. It was a challenge going from practically none to 30 but I'm so glad I did it. Here's to a few more posts!